The Duke Big Data for Reproductive Health (bd4rh) team, part of the Center for Global Reproductive Health, is working on novel ways to visualize contraceptive calendar data collected by the Demographic and Health Survey (DHS) program. The interdisciplinary group of researchers has created online, user-friendly tools to promote accessibility of this important but underutilized data. They aim to facilitate its use by researchers, program implementers and advocates. 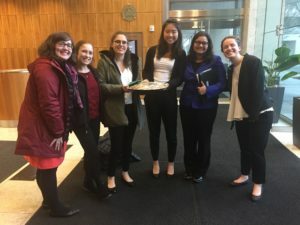 On Friday, March 22nd, team leaders Dr. Amy Finnegan and Kelly Hunter and undergraduate students Nicole Rapfogel, Celia Mizelle, Saumya Sao, Molly Paley, and Daisy Fang travelled to the DHS Program office in Rockville, Maryland to meet with key stakeholders who collect and use the contraceptive calendar data. They shared novel approaches to visualizing the calendar data: specifically, a chord diagram tool that allows users to see how contraceptive users flow from using one contraceptive method during a selected starting month to non-use (contraceptive discontinuation) or a different method (contraceptive switching). They also shared a tool that displays trends of contraceptive prevalence and discontinuation over time and allows users to view differences in rates based on a variety of sociodemographic and geographic variables. 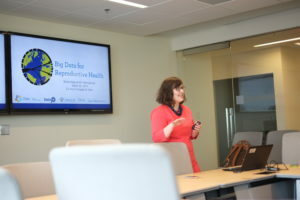 Dr. Finnegan also discussed the use of big data analytics to provide fresh insights into the data and shared preliminary results from an unsupervised machine learning model her team has created to better understand contraceptive trajectories. The team team discussed potential opportunities for collaboration with DHS technical staff, the Track20 project, and Avenir Health – groups also working to facilitate use of the data to inform research and programmatic efforts worldwide. The meeting highlighted areas of potential future development for the BD4RH team, including ideas for new data visualization tools and connecting to ground-level stakeholders and program managers who might use the data in their work. In addition to their presentation at the DHS Program, bd4rh gave a poster presentation at the 2018 International Conference on Family Planning held in Kigali, Rwanda this year. They will also present at the annual meeting of the Population Association of America (Austin, TX; April 9, 2019) and the Women Deliver 2019 Global Conference held in Vancouver, Canada on June 4-7. If you are interested in learning more about the team’s data visualization techniques as well as updates from the meeting about contraceptive calendar data accessibility, consider attending the team’s local stakeholder meeting on Friday April 19th from 8:30-9:30 am in Trent Hall. Breakfast will be served. You can RSVP for the event here.